Why waste precious staff time checking in patients? TouchHealth V-Reception (“Virtual Reception”) patient kiosk is a simple SMS notification system which sends your providers a text message when their patient is in the waiting room. With TouchHealth V-Reception, your patients arrive in the waiting room, choose their provider from a list on a Touch screen, enter their first name and touch “Check-In.” The provider receives a simple text message – “Sarah is in the waiting room.” With certain packages, the provider can send an acknowledgement with a single touch. Setup is quick and easy. We provide full step-by-step instructions in your TouchHealth account. You can also choose the full-service option — a TouchHealth professional will purchase the kiosk hardware of your choice, have it shipped to our facility where it will be set up, customized and then shipped to you. All you will need to do is plug it in. The cost of this service is $120 plus the cost of the kiosk hardware you select (usually $40-$100 on Amazon). Monthly prices are below. *Kiosk ProTM ($19.95 in the app store) or similar software is also required to lock your tablet into kiosk mode. This is a one-time purchase. *You do NOT need a premium TouchHealth subscription to support more than 3 providers on the kiosk. The V-Reception plans are billed independently. 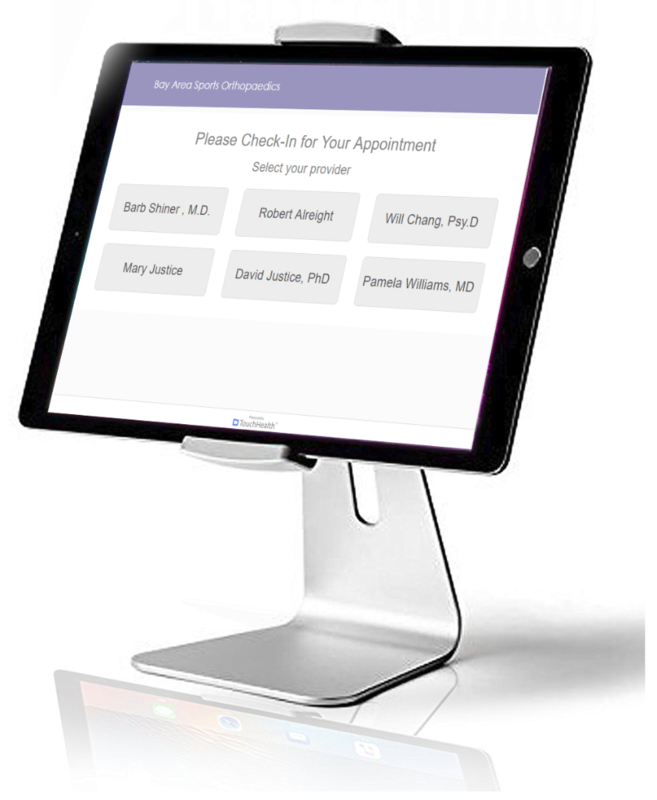 To create a V-Reception Kiosk in your waiting room, get started by creating a free TouchHealth account. Once you have an account, you can add the V-Reception feature from your Settings tab. Start by Getting Your Free TouchHealth Account!